A major new report published today has found that the health of over one million people in the UK is at risk from aircraft noise. 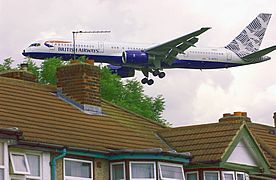 The report, Aircraft Noise and Public Health: The Evidence is Loud and Clear, commissioned by campaign group HACAN and produced by the Aviation Environment Federation, has called on the Government to undertake a complete review of all its polices to ensure that they take full account of the health impacts of aircraft noise. See full findings at Aviation Environment Federation.